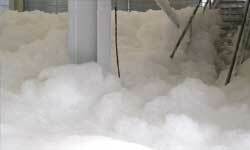 Foam water fire sprinkler systems are typically used for hazardous areas. The system uses a mixture of water and low expansion foam concentrate creating a foam spray. With this foam water, flammable liquids can be quickly controlled and diffused. These types of fire sprinkler systems are the main source of fire suppression in most industrial areas. Building an oxygen free environment, foam water sprinkler systems can be incorporated into nearly any type of system including wet, dry, pre-action or deluge. The correct amount of foam can then be regulated based on the hazardous materials that are intended on being controlled.